We're happy to announce the release of EPlug 1.2.5. Even though the change in the version number is quite small, the changes which have gone into this version are very interesting. As you can see it has been vastly extended, with nearly all information about the column which you might want to know about, including its type, the label and all other properties. The support for DataBooks/DataRows has been greatly improved and the plugin does now support a lot more variations on how to achieve the metadata. 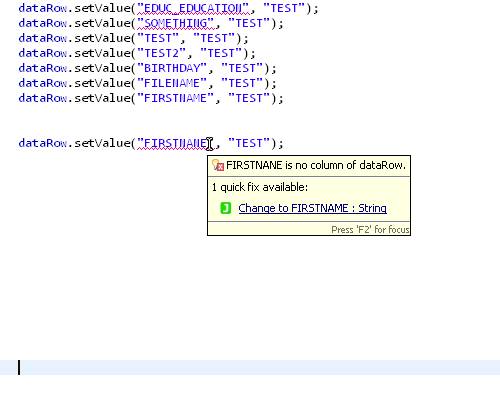 For example cloning of ColumnDefinitions, assigning of RowDefinitions and even getDataRow(...) and similar methods are now processed to acquire the metadata and column information. While this compiles completely fine in pure Java (because callAction(...) does accept an Object vararg), EPlug would flag it with an error because getValue(...) returns an Object but the server-side expects a BigDecimal. With this update there is now a build option available in the Project/EPlug settings to ignore such errors, allowing to pass Objects to the server side without checks. Misspelled a column name? No problem! There is now a new build option in the Project/EPlug settings which allows to enable the automatic check of complement files. A "complement" file is simply the "other side", for example for the lifecycle-object the complement file is the workscreen, and vice versa. 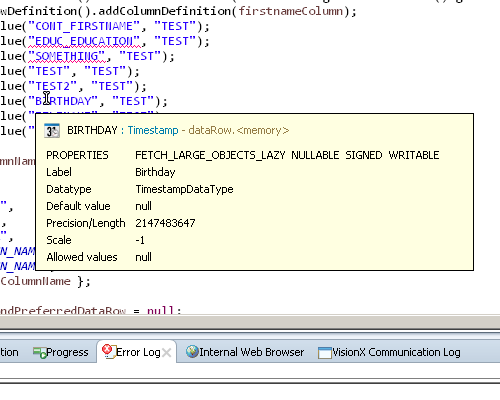 That means that now workscreens are automatically checked if the lifecycle object changes. We are still unable to determine the exact databook in such circumstances, but we do now simply provide all columns as completion suggestions. What we can do is provide full hover and build support for these functions. VisionX is now a lot more talkative, it informs EPlug about file changes. If "Auto Reload" is enabled in EPlug, all files that have been changed by VisionX will now be reloaded and checked automatically. The same accounts for changed metadata.